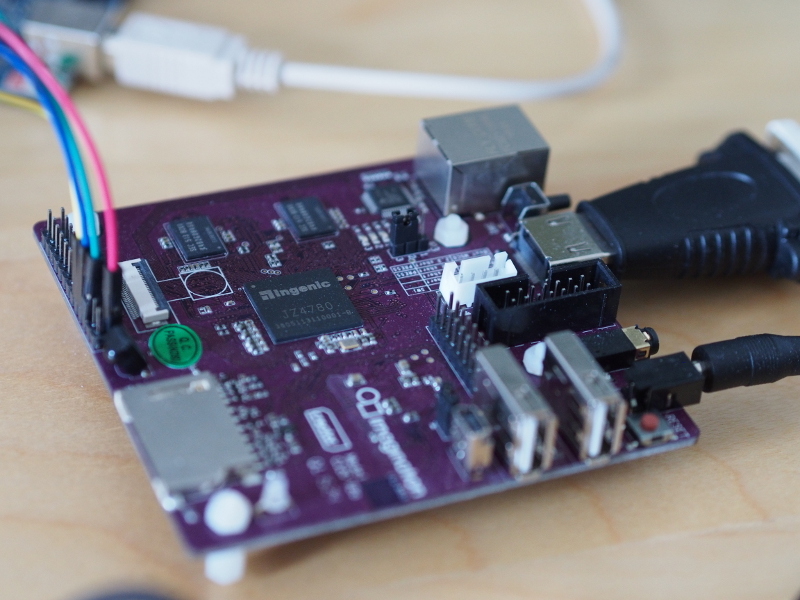 As described previously, having hopefully done enough to modify the kernel – Fiasco.OC – for the Ben NanoNote, it then became necessary to investigate the bootstrap package that is responsible for setting up the hardware and starting the kernel. This package resides in the L4Re distribution, which is technically a separate thing, even though both L4Re and Fiasco.OC reside in the same published repository structure. With the listed packages available, it should be possible to build the examples that will eventually interest us. Some of these appear superfluous – x86emu, for instance – but some of the more obviously-essential packages have dependencies on these other packages, and so we cannot rely on our intuition alone! This assumes that the build directory used when building the kernel is called mybuild. The Makefile will try and copy the kernel into the final image to be deployed and so needs to know where to find it. Candidates for the latter category include all awkward privileged or privilege-escalating instructions outside the bootstrap package. Fortunately, though, we don’t need to worry about them very much at all. Since the kernel will be obliged to trap them, we can just keep them where they are and concede that there is nothing else we can do with them. Here, with the .set directives, we switch this little region of code to MIPS32r2 compliance and emit our forbidden instruction into the output. Since the kernel will take care of it in the end, the compiler shouldn’t be made to feel that it has to defend us against it. In L4Re, there are also issues experienced with the CI20 that will also affect the Ben, such as an awkward and seemingly compiler-related issue affecting the way programs are started. In this regard, I just kept my existing patches for these things applied. My other platform-related adjustments for the Ben have mostly borrowed from support for the CI20 where it existed. For instance, the bootstrap package’s definition for the Ben (in l4/pkg/bootstrap/server/src/platform/qi_lb60.cc) just takes the CI20 equivalent, eliminates superfluous features, modifies details that are different between the SoCs, and changes identifiers. The general definition for the Ben (in l4/mk/platforms/qi_lb60.conf) merely acknowledges differences in some basic platform details. The CI20 was not supported with a hardware definition describing memory regions and interrupts used by the io package. Taking other devices as inspiration, I consulted the device documentation and wrote a definition when experimenting with the CI20. For the Ben, the form of this definition (in l4/pkg/io/io/config/plat-qi_lb60/hw_devices.io) remains similar but is obviously adjusted for the SoC differences. One topic that I have not really mentioned at all is that pertaining to device drivers. I would not have even started this work if I didn’t feel there was a chance of seeing some signs of success from the Ben. Although the Ben, like the CI20, has the capability of exposing a serial console to the outside world, meaning that it can emit messages via a cable to another computer and receive input from that computer, unlike the CI20, its serial console pins are not particularly convenient to use: they really require wires to be soldered to some tiny pads that are found in the battery compartment of the device. Now, my soldering skills are not very good, and I also want to be able to put the battery back into the device in future. I did try and experiment by holding wires against the pads, this working once or twice by showing output when booting the Ben into its more typical Linux-based environment. But such experiments proved to be unsustainable and rather uncomfortable, needing some kind of “guitar grip” while juggling cables and holding down buttons. So I quickly knew that I would need to get output from the Ben in other ways. 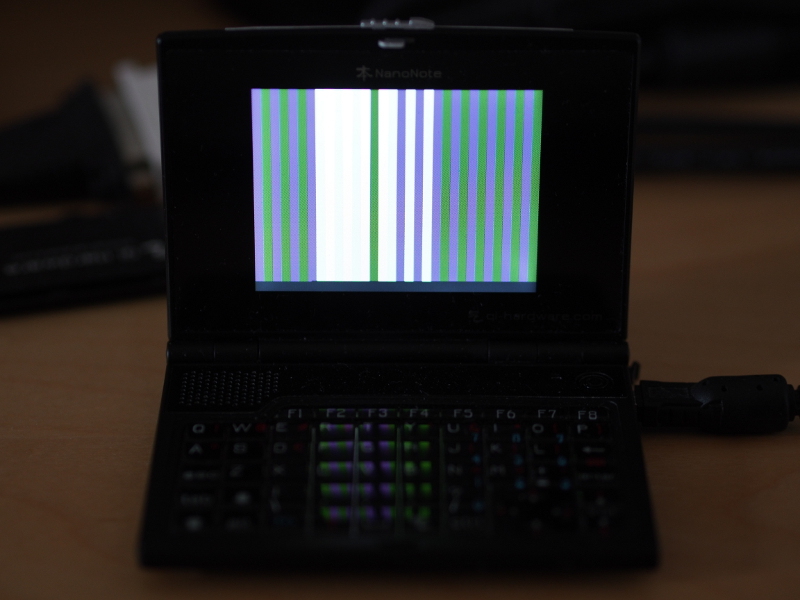 Having deployed low-level payloads to the Ben before, I knew something about the framebuffer, so I had some confidence about initialising it and getting something on the screen that might tell me what has or hasn’t happened. And I adapted my code from this previous effort, itself being derived from driver code written by the people responsible for the Ben, wrapping it up for L4Re. I tried to keep this code minimally different from its previous incarnation, meaning that I could eliminate certain kinds of mistakes in case the code didn’t manage to do its job. With this in place, I felt that I could now consider trying out my efforts and seeing what, if anything, might happen. Being in the now-familiar position of believing that enough has been done to make the software run, I now considered an attempt at actually bootstrapping the kernel. It may sound naive, but I almost expected to be able to compile everything – the kernel, L4Re, my drivers – and for them all to work together in harmony and produce at least something on the display. But instead, after “Starting kernel …”, nothing happened. It should be said that in these kinds of exercises, just one source of failure need present itself and the outcome is, of course, failure. And I can confirm that there were many sources of failure at this point. The challenges, then, are to identify all of these and then to eliminate them all. But how can you even know what all of these sources of failure actually are? It seemed disheartening, but then there are two kinds of strategy that can be employed: to investigate areas likely to be causing problems, and to take every opportunity to persuade the device to tell us what is happening. And with this, the debugging would begin. So, we find ourselves in a situation where the compiler is doing the right thing for the code it is generating, but it also notices when the programmer has chosen to do what is now the wrong thing. We must therefore track down these instructions and offer a supported alternative. Previously, we introduced a special configuration setting that might be used to indicate to the compiler when to choose these alternative sequences of instructions: CPU_MIPS32_R1. This gets expanded to CONFIG_CPU_MIPS32_R1 by the build system and it is this identifier that gets used in the program code. I have put off giving out the details so far, but now is as good a time as any to provide some about the instructions that the JZ4720 (the SoC in the Ben NanoNote) doesn’t seem to support. Some of them are just conveniences, offering a single instruction where many would otherwise be needed. Others offer functionality that is not always trivially replicated. We have already mentioned rdhwr, and this is precisely the kind of instruction that can pose problems, these mostly being concerned with it offering access to some (supposedly) privileged information from an unprivileged processor mode. However, since the kernel runs in a privileged mode, typically referred to as “kernel mode”, we won’t see rdhwr when doing our modifications to the kernel. And since the need to provide rdhwr also applied to the JZ4780 (the SoC in the MIPS Creator CI20), it turned out that I didn’t need to do much in addition to what others had already done in supporting it. Another instruction that requires a bridging of privilege levels is synci. If we discover synci being used in the kernel, it is possible to rewrite it in terms of the equivalent cache instructions. However, outside the kernel in unprivileged mode, those cache instructions cannot be used and we would not wish to support them either, because “user mode” programs are not meant to be playing around with such aspects of the hardware. The solution for such situations is to “trap” synci when it gets used in unprivileged code and to handle it using the same mechanism as that employed to handle rdhwr: to treat it as a “reserved instruction”. asm volatile ("cache 0x01, %0\n"
The other unsupported instructions don’t create as many problems. The di (disable interrupts) and ei (enable interrupts) instructions are really shorthand for modifications to the processor’s status register, albeit performing those modifications “atomically”. In principle, in cases where I have written out the equivalent sequence of instructions but not done anything to “guard” these instructions from untimely interruptions or exceptions, something bad could happen that wouldn’t have happened with the di or ei instructions themselves.
" andi  $t0, %[status], 0xff  \n"
"  li    $t1, 0xffffff00       \n"
"  and   $t2, $t2, $t1         \n"
"  or    $t2, $t2, $t0         \n"
"  ins   $t2, %[status], 0, 8  \n"
Note how temporary registers are employed to isolate the bits from the status register and to erase bits in the $t2 register before these two things are combined and stored in $t2. The rdhwr instruction has been mentioned quite a few times already. In the kernel, it is handled in the kernel/fiasco/src/kern/mips/exception.S file, specifically in the routine called “reserved_insn”. When the processor encounters an instruction it doesn’t understand, the kernel should have been configured to send it here. I will admit that I knew little to nothing about what to do to handle such situations, but the people who did the MIPS port of the kernel had laid the foundations by supporting one rdhwr variant, and I adapted their work to handle another. The first and last portions of the above representation identify the instruction in general, with the bits for the second and next-to-last portions being set to zero presumably because they are either not needed to encode an instruction in this category, or they encode two parameters that are not needed by this particular instruction. To be honest, I haven’t checked which explanation applies, but I suspect it is the latter. Now, if $at is equal to $k0, the instruction value is identified as encoding rdhwr accessing SYNCI_Step, with the target register being masked out so as not to confuse things. Later on, the target register is itself selected and some trickery is employed to get the appropriate data into that register before returning from this routine. For the above case and for the synci instruction, the work that needs doing once such an instruction has been identified is equivalent to what would have happened had it been possible to just insert into the code the alternative sequence of instructions that achieves the same thing. So, for synci, the equivalent cache instructions are executed before control is returned to the instruction after synci in the program where it appeared. Thus, upon encountering an unsupported instruction, control is handed over from an unprivileged program to the kernel, the instruction is identified and handled using the necessary privileged instructions, and then control is handed back to the unprivileged program again. In fact, most of my efforts in exception.S were not really directed towards these two awkward instructions. Instead I had to deal with the use of quite a number of ext and ins instructions. Although it seems tempting to just trap those as well and to provide handlers for them, that would add considerable overhead, and so I added some macros to provide the same functionality when building the kernel for the Ben. Looking at my patches for the kernel now, I can see that there isn’t much else to cover. One or two details are rather important in the context of the Ben and how it manages to boot, however, and the process of figuring out those details was, like much else in this exercise, time-consuming, slightly frustrating, and left surprisingly little trace once the solution was found. At this stage, not everything was perfectly transcribed or expressed, leaving a degree of debugging activity that would also need to be performed in the future. So, with a kernel that might be runnable, I considered what it would take to actually launch that kernel. This led me into the L4 Runtime Environment (L4Re) code and specifically to the bootstrap package. It turns out that the kernel distribution delegates such concerns to other software, and the bootstrap package sits uneasily alongside other packages, it being perhaps the only one amongst them that can exercise as much privilege as the kernel because its code actually runs at boot time before the kernel is started up. Having undertaken some initial investigations into running L4Re and Fiasco.OC on the MIPS Creator CI20, I envisaged attempting to get this software running on the Ben NanoNote, too. For a while, I put this off, feeling confident that when I finally got round to it, it would probably be a matter of just choosing the right compiler options and then merely fixing all the mistakes I had made in my own driver code. Little did I know that even the most trivial activities would prove more complicated than anticipated. As you may recall, I had noted that a potentially viable approach to porting the software would merely involve setting the appropriate compiler switches for “soft-float” code, thus avoiding the generation of floating point instructions that the JZ4720 – the SoC on the Ben NanoNote – would not be able to execute. A quick check of the GCC documentation indicated the availability of the -msoft-float switch. And since I have a working cross-compiler for MIPS as provided by Debian, there didn’t seem to be much more to it than that. Until I discovered that the compiler doesn’t seem to support soft-float output at all. I had hoped to avoid building my own cross-compiler, and apart from enthusiastic (and occasionally successful) attempts to build the Debian ones before they became more generally available, the last time I really had anything to do with this was when I first developed software for the Ben. As part of the general support for the device an OpenWrt distribution had been made available. Part of that was the recipe for building the cross-compiler and other tools, needed for building a kernel and all the software one would deploy on a device. I am sure that this would still be a good place to look for a solution, but I had heard things about Buildroot and so set off to investigate that instead. So although Buildroot, like OpenWrt, is promoted as a way of building an entire system, it too offers help in building just the toolchain if that is all you need. Getting it to build the appropriately-configured cross-compiler is a matter of the familiar “make menuconfig” seen from the Linux kernel source distribution, choosing things in a menu – for us, asking for a soft-float toolchain, also enabling C++ support – and then running “make toolchain”. As a result, I got a range of tools in the output/host/bin directory prefixed with mipsel-buildroot-linux-uclibc. Changing the compiler settings for Fiasco.OC (in kernel/fiasco/src/Makeconf.mips) and L4Re (in l4/mk/arch/Makeconf.mips), and making sure not to enable any floating point support in Fiasco.OC, and recompiling the code to produce soft-float output was straightforward enough. However, despite the portability of this software, it isn’t completely C and C++ code: lurking in various places (typically in mips or ARCH-mips directories) are assembly language source files with the .S prefix, and in some C and C++ files one can also find “asm” statements which embed assembly language instructions within higher-level code. With the assumption that by specifying the right compiler switches, no floating point instructions will be produced from C or C++ source code, all that remains is to determine whether any of these other code sections mention such forbidden instructions. It was asserted that Fiasco.OC doesn’t use any floating point instructions at all. Meanwhile, I couldn’t find any floating point instructions in the generated code: “mipsel-linux-gnu-objdump -D some-output-file” (or, indeed, “mipsel-buildroot-linux-uclibc-objdump -D some-output-file”) now started to become a familiar acquaintance if not exactly a friend! In fact, the assembly language files and statements would provide other challenges in the form of instructions unsupported by the JZ4720. Again, I had the choice of either trying to support MIPS32r2 instructions, like rdhwr, by providing “reserved instruction” handlers, or to rewrite these instructions in forms suitable for the JZ4720. At least within Fiasco.OC – the “kernel” – where the environment for executing instructions is generally privileged, it is possible to reformulate MIPS32r2 instructions in terms of others. I will return to the details of these instructions later on. As noted above, I don’t use the kernel debugger, but I still made some edits that might make it possible to use it later on. For the most part, the bulk of my time and effort was spent in the src/kern/mips hierarchy, occasionally discovering things in src/drivers/mips that also needed some attention. This is not by any means enough, even disregarding any code required to do things specific to the Ben. But with the additional configuration setting for the JZ4720, which I called CPU_MIPS32_R1, it becomes possible to go around inside the kernel code and start to mark up places which need different instruction sequences for the Ben, using CONFIG_CPU_MIPS32_R1 as the symbol corresponding to this setting in the code itself. There are places where this new setting will also change the compiler’s behaviour: in kernel/fiasco/src/Makeconf.mips, the -march=mips32 compiler switch is activated by the setting, preventing the compiler from generating instructions we do not want. For the board-specific functionality (found in kernel/fiasco/src/kern/mips/bsp/qi_lb60), I took the CI20′s collection of files as a starting point. Fortunately for me, the Ben’s JZ4720 and the CI20′s JZ4780 are so similar that I could, with reference to Linux kernel code and other sources of documentation, make a first effort at support for the Ben by transcribing and editing these files. Some things I didn’t understand straight away, and I only later discovered what some parameters to certain methods really mean. We can see how the later product (JZ4780) has evolved from the earlier one (JZ4720), with some registers supporting more bits, exposing control over an increased number of timers. A lot of the details are the same, which was fortunate for me! Even the oddly-located timer stop registers, separated by intervals of 16 bytes (0×10) instead of 4 bytes, have been preserved between the products. In the same directory, there is a file covering timer functionality from the perspective of the kernel: timer-jz4740.cpp. Here, the above registers are manipulated to realise certain operations – enabling and disabling timers, reading them, indicating which interrupt they may cause – and the essence of this work again involves checking documentation sources, register layouts, and making sure that the intent of the code is preserved. It may be mundane work, but any little detail that is not correct may prevent the kernel from working. At this point, the essential hardware has mostly been described, building on all the work done by others to port the kernel to the MIPS architecture and to the CI20, merely adding a description of the differences presented by the Ben. When I made these changes, I was slowly immersing myself in the code, writing things that I felt I mostly understood from having previously seen code accessing certain hardware features of the Ben. But I knew that there will still some way to go before being able to expect anything to actually work. From this point, I would now need to confront the unimplemented instructions, deal with the memory layout, and figure out how the kernel actually gets launched in the first place. This would also mean that I could no longer keep just adding and changing code and feeling like progress was being made: I would actually have to try and get the Ben to run something. And as those of us who write software know very well, there can be nothing more punishing than being confronted with the behaviour of a program that is incorrect, with the computer caring not about intentions or aspirations but only about executing the logic whether it is correct or not. For quite some time, I have been interested in alternative operating system technologies, particularly kernels beyond the likes of Linux. Things like the Hurd and technologies associated with it, such as Mach, seem like worthy initiatives, and contrary to largely ignorant and conveniently propagated myths, they are available and usable today for anyone bothered to take a look. Indeed, Mach has had quite an active life despite being denigrated for being an older-generation microkernel with questionable performance credentials. But one technological branch that has intrigued me for a while has been the L4 family of microkernels. Starting out with the motivation to improve microkernel performance, particularly with regard to interprocess communication, different “flavours” of L4 have seen widespread use and, like Mach, have been ported to different hardware architectures. One of these L4 implementations, Fiasco.OC, appeared particularly interesting in this latter regard, in addition to various other features it offers over earlier L4 implementations. Meanwhile, I have had some success with software and hardware experiments with the Ben NanoNote. 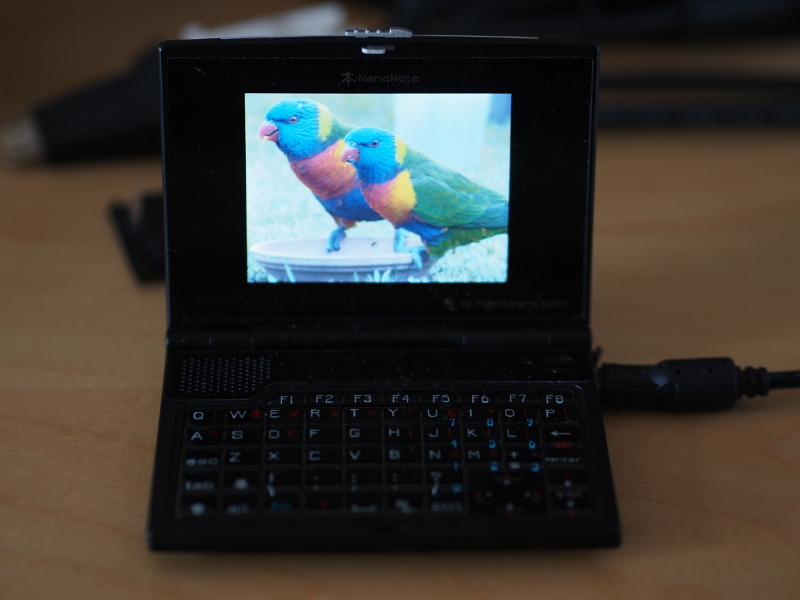 As you may know or remember, the Ben NanoNote is a “palmtop” computer based on an existing design (apparently for a pocket dictionary product) that was intended to offer a portable computing experience supported entirely by Free Software, not needing any proprietary drivers or firmware whatsoever. Had the Free Software Foundation been certifying devices at the time of its introduction, I imagine that it would have received the “Respects Your Freedom” certification. So, it seems to me that it is a worthy candidate for a Free Software porting exercise. Now, it so happened that Fiasco.OC received some attention with regards to being able to run on the MIPS architecture. The Ben NanoNote employs a system-on-a-chip (SoC) whose own architecture closely (and deliberately) resembles the MIPS architecture, but all information about the JZ4720 SoC specifies “XBurst” as the architecture name. In fact, one can regard XBurst as a clone of a particular version of the MIPS architecture with some additional instructions. Indeed, the vendor, Ingenic, subsequently licensed the MIPS architecture, produced some SoCs that are officially MIPS-labelled, culminating in the production of the MIPS Creator CI20 product: a development board commissioned by the then-owners of the MIPS portfolio, Imagination Technologies, utilising the Ingenic JZ4780 SoC to presumably showcase the suitability of the MIPS architecture for various applications. It was apparently for this product that an effort was made to port Fiasco.OC to MIPS, and it was this effort that managed to attract my attention. It was just as well others had done this hard work. Although I have been gradually immersing myself in the details of how MIPS-based CPUs function, having written some code that can boot the Ben, run a few things concurrently, map memory for different processes, read the keyboard and show things on the screen, I doubt that my knowledge is anywhere near comprehensive enough to tackle porting an existing operating system kernel. But knowing that not only had others done this work, but they had also targeted a rather similar system, gave me some confidence that I might be able to perform the relatively minor porting exercise to target the Ben. But first I felt that I had to gain experience with Fiasco.OC on MIPS in a more convenient fashion. 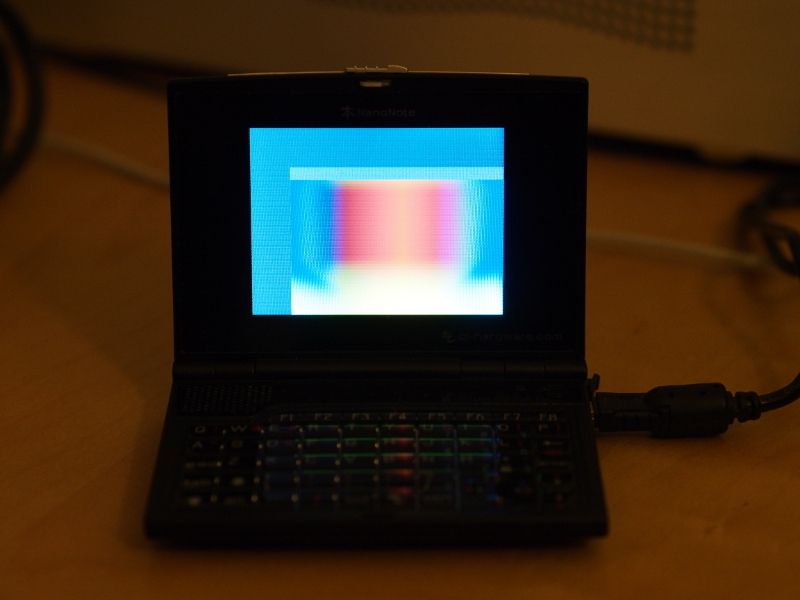 Although I had muddled through the development of code on the Ben, reusing existing framebuffer driver code and hacking away until I managed to get some output on the display, I felt that if I were to continue my experiments, a more efficient way of debugging my code would be required. With this in mind, I purchased a MIPS Creator CI20 and, after doing things with the pre-installed Debian image plus installing a newer version of Debian, I set out to try Fiasco.OC on the hardware. According to the Fiasco.OC features page, the “Ci20″ is supported. Unfortunately, this assertion of support is not entirely true, as we will come to see. Previously, I mentioned that the JZ4720 in the Ben NanoNote largely implements the instructions of a certain version of the MIPS architecture. Although the JZ4780 in the CI20 introduces some new features over the JZ4720, such as a floating point arithmetic unit, it still lacks various instructions that are present in commonly-used MIPS versions that might be taken as the “baseline” for software support: MIPS32 Release 2 (MIPS32r2), for instance. Upon trying to get Fiasco.OC to start up, I soon encountered one of these instructions, or at least a particular variant of it: rdhwr (read hardware register) accessing SYNCI_Step (the instruction cache line size). This sounds quite fearsome, but I had been somewhat exposed to cache management operations when conjuring up my own code to run on the Ben. In fact, all this instruction variant does is to ask how big the step size has to be in a loop that invalidates the instruction cache, instead of stuffing such a value into the program when compiling it and thus making an executable that will then be specific to a particular processor. Fortunately, those hardworking people who had already ported the code to MIPS had previously encountered another rdhwr variant and had written code to “trap” it in the “reserved instruction” handler. That provided some essential familiarisation with the kernel code, saving me the effort of having to identify the right place to modify, as well as providing a template for how such handlers should operate. I feel fairly competent writing MIPS assembly language, although I would manage to make an easy mistake in this code that would impede progress much later on. There were one or two other things that also needed fixing up, mentioned briefly in my review of the year article, generally involving position-independent code that was not called correctly and may have been related to me using a generic version of GCC instead of some vendor-modified version. But as I described in that article, I finally managed to boot Fiasco.OC and run a program on top of it, writing the output via the serial connection to my personal computer. I realised that compiling such code for the Ben would either require the complete avoidance of floating point instructions, due to the lack of that floating point unit in the JZ4720, or that I would need to provide implementations of those instructions in software. Fortunately, GCC provides a mode to compile “soft-float” versions of C and C++ programs, and so this looked like the next step. And so, apart from polishing support for features of the Ben like the framebuffer, input/output pins, the clock circuitry, it didn’t really seem that there would be so much to do. As it so often turns out with technology, optimism can lead to unrealistic estimates of how much time and effort remains in a project. I now know that a description of all this effort would be just too much for a single article. So, I will wrap this article up with a promise that the next one will descend into the details of compilers, assembly language, the SoC, and before too long, we will get to see the inconvenience of debugging low-level software with nothing more than a framebuffer.